[150 Pages Report] The digital textile printing market was valued at USD 1.67 Billion in 2017 and is expected to reach USD 2.31 Billion by 2023, at a CAGR of 5.59% during the forecast period. The base year considered for the study is 2017 and the forecast period is between 2018 and 2023. The objective of the report is to provide a detailed analysis of the market on the basis of printing process, ink type, application, and geography. 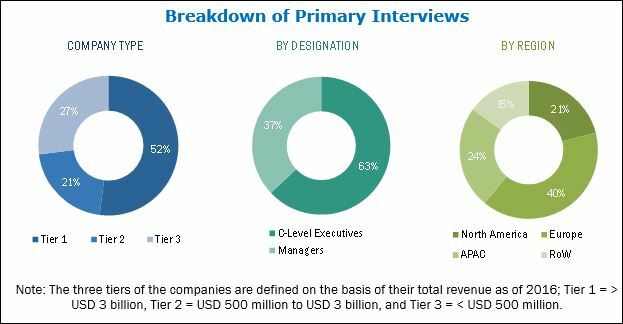 The report also provides information regarding the major factors (drivers, restraints, opportunities, and challenges) influencing the growth of the market, along with a detailed value chain. In addition, the key players for digital textile printing are strategically profiled, and their market rank and core competencies are comprehensively analyzed, along with detailing the competitive landscape for market players and describing the product launches, product developments, acquisitions, partnerships, expansions, agreements, and collaborations in the market. 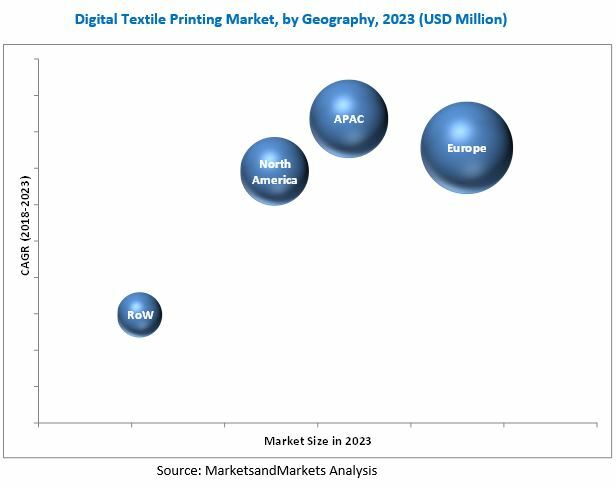 The digital textile printing market comprises business entities such as Aeoon Technologies GmbH (Austria), ATPColor Srl (Italy), Bordeaux Digital PrintInk Ltd. (Israel), Durst Phototechnik AG (Italy), Hollanders Printing Systems B.V. (Netherlands), Kornit Digital (Israel), SPGPrints B.V. (Netherlands), Brother International Corporation (Japan), Colorjet Group (India), d.gen Inc. (South Korea), Konica Minolta, Inc. (Japan), Mimaki Engineering Co., Ltd. (Japan), Mutoh Holdings Co. Ltd. (Japan), Ricoh Company Ltd (Japan), Roland DG Corporation (Japan), Seiko Epson Corporation (Japan), DuPont (US), Electronics For Imaging, Inc. (US), and Huntsman International LLC (US). The digital textile printing market is expected to reach USD 2.31 Billion by 2023 from USD 1.76 Billion in 2018, at a CAGR of 5.59% between 2018 and 2023. The major factors driving the growth of the market include the growing demand for sustainable printing; increasing demand for digital textile printing in the garment and advertising industries; shortening lifespan and faster adaptability of fashion designs; development of new technologies in the textile industry; and reduced per unit cost of printing with digital printers. The market for roll to roll printing process held the largest market share in 2017. In 2017, the roll to roll printing process accounted for more than two-third of the digital textile printing market. This process is majorly used in textile and decor, soft signage, and industrial applications. The major uses in textile and decor are home textile, upholstery, linens, drapery, scarves, ties, bags, sportswear, footwear, clothes, interior decor, etc. Uses in the soft signage and industrial segments include carpets, posters, banners, flags, vehicle wrapping, wallpaper, building material, POS display, etc. The market for digital textile printing market for ink is expected to grow significantly during the forecast period. Sublimation inks are widely used in the textile as well as the clothing and soft signage segments owing to benefits such as non-solubility, resistance to damage, and colorfastness. Sublimation inks are used on polyester, acetate rayon, poly-lycra, and acrylics and require post-treatment heat. In 2017, the textile and decor and direct to garment segments contributed the major share of market. Polyester is extensively used in digital textile printing owing to benefits such as colorfastness, strength, and durability, and also due to its resistance to stretch, shrinkage, and abrasion. With the growing demand for textiles across the globe and the rising demand for polyester fabrics in the textile industry, the textile and decor and direct to garment segments will continue to account for the maximum share of this market during the next five years as well. The digital textile printing market in Europe is expected to witness growth in the near future because of the economic recovery and increased growth in the printing industry. Digital textile printers are increasingly being deployed in Europe to meet the need of faster turnaround times, shorter runs, and more variable data printing with high quality. The use of digital textile printers in the fashion industry is another factor driving the growth of this market in this region. The growth in the textile market in countries such as China and India, due to the low labor cost, has fueled the growth of the market in APAC. Since the last three decades, China has been the leading producer and exporter of textiles. Additionally, investments in inventory such as shuttleless looms and capacity expansions to manufacture good quality textiles are anticipated to boost the textile and clothing market. Dominant players in the digital textile printing market include Aeoon Technologies GmbH (Austria), ATPColor Srl (Italy), Bordeaux Digital PrintInk Ltd. (Israel), Durst Phototechnik AG (Italy), Hollanders Printing Systems B.V. (Netherlands), Kornit Digital (Israel), SPGPrints B.V. (Netherlands), Brother International Corporation (Japan), Colorjet Group (India), d.gen Inc. (South Korea), Konica Minolta, Inc. (Japan), Mimaki Engineering Co., Ltd. (Japan), Mutoh Holdings Co. Ltd. (Japan), Ricoh Company Ltd (Japan), Roland DG Corporation (Japan), Seiko Epson Corporation (Japan), DuPont (US), Electronics for Imaging, Inc. (US), and Huntsman International LLC (US).